Murphy Cabinet Beds offer a unique alternative to traditional bed frames or futon frames that are great for small places. All styles feature a high grade, queen size (80" x 60") gel memory foam mattress, and can fold up into a low-profile cabinet to get out of the way when not in use. Murphy Cabinet Beds are available in a variety of styles and finishes to match any decor. All our frames are constructed of solid, high quality, environmentally friendly hardwoods. Matching furniture is also available including, dressers, desks, and more! Check out all the options below! All pieces can be shipped anywhere in the continental United States. Contact Us to receive a shipping quote. A Clover Murphy Cabinet Bed. Roll Over The Image To See It In Action! 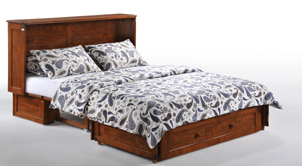 The Murphy Cabinet Bed Easily Converts To A Queen Bed In Minutes! 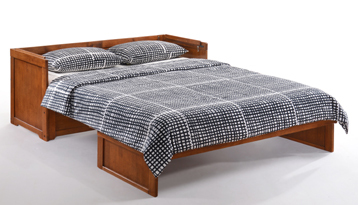 Matching Futons, Beds, Dressers, And Desks are also available. All cabinets feature a 10 year limited warranty. The queen gel memory foam mattress features a 3 year limited warranty. The Clover Murphy Cabinet Bed In Cherry Finish. Roll Over The Image To See It Closed! Includes a high-grade tri-fold queen size (60" x 80") gel memory foam mattress, optional wood or metal nobs, and a rolling accessory drawer that can be used in both the bed or cabinet position. Optional fold-up nightstand trays are also available. The cabinet also features a built-in power strip / usb charger! The Daisy Murphy Cabinet Bed In Buttercream Finish. Roll Over The Image To See It Closed! 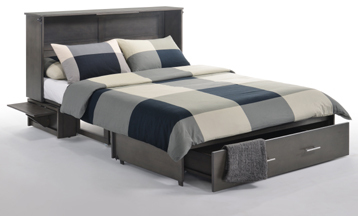 Includes a high-grade tri-fold queen size (60" x 80") gel memory foam mattress and a rolling accessory drawer that can be used in both the bed or cabinet position. Optional fold-up nightstand trays are also available. The cabinet also features a built-in power strip / usb charger! Finish is available in buttercream. The Sagebrush Murphy Cabinet Bed In Stonewash Finish. Roll Over The Image To See It Closed! Includes a high-grade tri-fold queen size (60" x 80") gel memory foam mattress, fold-up tray tables on each side, and a rolling accessory drawer that can be used in both the bed or cabinet position. The cabinet also features a built-in power strip / usb charger! Finish is available in stonewash and dark chocolate. Includes a high-grade tri-fold queen size (60" x 80") gel memory foam mattress. Finishes are available in cherry, dark chocolate, white, and stonewash. 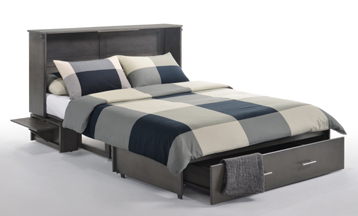 Check Out How The Cube Murphy Cabinet Bed Easily Converts From Cabinet To Bed In No Time! 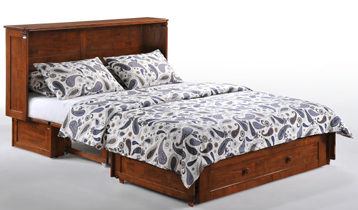 The Murphy Tray Nighstand Shown On The Sagebrush Cabinet Bed (Included With Frame). These Trays Can Be Added To The Clover And Daisy Cabinets As Well. Roll Over The Image To See Them Fold Down! 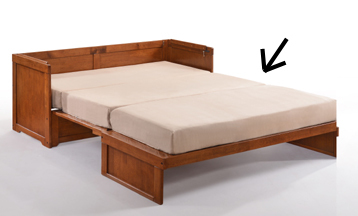 Adds a set of fold-up nightstand trays to the Clover Murphy Cabinet Bed or Daisy Murphy Cabinet Bed. These are great for giving guests a a place to have a lamp or store their items while visiting, which can then fold out of the way when not in use! Finishes are available in cherry, dark chocolate, white, and buttercream. Roll Over The Image To See It Fold! 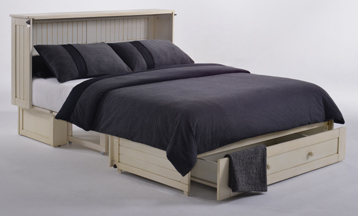 Included in all the cabinet bed packages above, the Queen Folding Gel Memory Foam Mattress can be used to replace a mattress in any of the Murphy Cabinet Beds, or by itself as a backup bed option. The mattress measures 60" x 80" x 6" thick.